What types of courses does Business Computer Skills offer? Are there any prerequisite classes necessary? Do I receive any university credit for the classes taken? - Business Computer Skills offers a variety of courses that focus on fundamental computer skills and business computer applications. Beginning courses involve introductory courses in PC operation, Internet and Windows fundamentals. 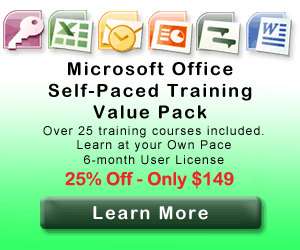 The Business Computer Applications training mainly focuses on Microsoft Office and Adobe products. We are continually updating our course selections to keep current with the needs of our customers. - People of all ages and backgrounds have taken classes with us. We cater to people looking to quickly build fundamental computer skills, and those who wish to move to an intermediate or advanced level for a given topic. Whether you are a beginner or a professional, Business Computer Skills has classes to fit your needs. - Business Computer Skills offers classes in over 300 locations nationwide. We also offer On-Site and Self-Paced Training options. Please check the course schedule page for specific date, time and location information for a particular class. - Most Business Computer Skills instructor classes start at $299 for single day classes. This fee includes the course book and additional practice materials. Multi-day course are priced differently. Please check the course schedule page for pricing information for a particular class. - Most classes are completed in a one-day session. The average class runs between 6-7 hours, with a break half way through the day. See class details for specific date/course duration/time information. - All students receive a complimentary course book and practice materials as part of their course registration fee. No additional textbooks or lab fees are needed. You will receive all course materials at the beginning of the course and they are yours to keep at course completion. - While most Business Computer Skills classes do not have prerequisite courses, some courses require prerequisite training. We provide a list of recommended prerequisite training for most of our classes to make sure our students are aware of what material is needed to get the most our of the course. Do I receive any university or CPE credit for the classes taken? - No, Business Computer Skills students do not receive university or CPE credits upon completion of any of our classes. Students receive a certificate of completion after they complete the course. - Simply locate the class you are interested in on the Business Computer Skills website, and select the registration link. All available classes will have a registration link displayed on the course detail page. You will then be prompted to set up a user account and provide payment information. You will receive email messages confirming your registration and payment.